After episode one of The Knick, the question on everyone’s lips is of course: what was going on with the beard dipping? A commitment to getting the historical details right is the answer (although we hope for the actor’s sake the liquid wasn’t completely true to life). 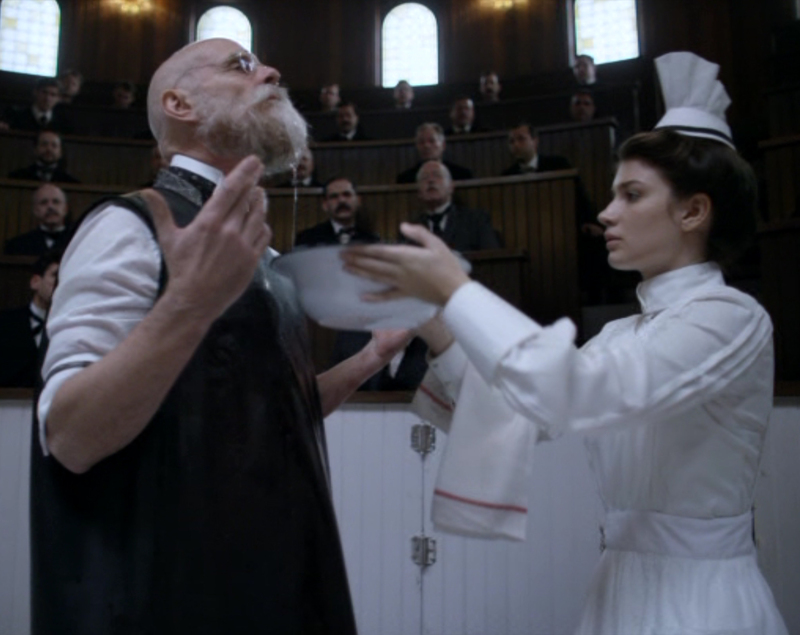 Dr. Christiansen (Matt Frewer) preps his beard for surgery, assisted by Nurse Elkins (Eve Hewson). Credit: HBO-Cinemax. The surgeons performing the emergency Caesarean early in the episode ran an operating theater following Listerian principles of cleanliness and antiseptic surgery. Joseph Lister (1827–1912) was a professor of surgery at the University of Glasgow in Scotland, who, influenced by Louis Pasteur’s germ theory, looked for methods to remove microorganisms from the environment during surgery. The introduction of chloroform and ether as anesthetic agents in the mid-19th century meant that surgery had become a much less painful process for patients (and allowed surgeons to focus on longer and more complex procedures). However, surgery remained dangerous, with postoperative infection continuing to be a serious, often fatal, problem. 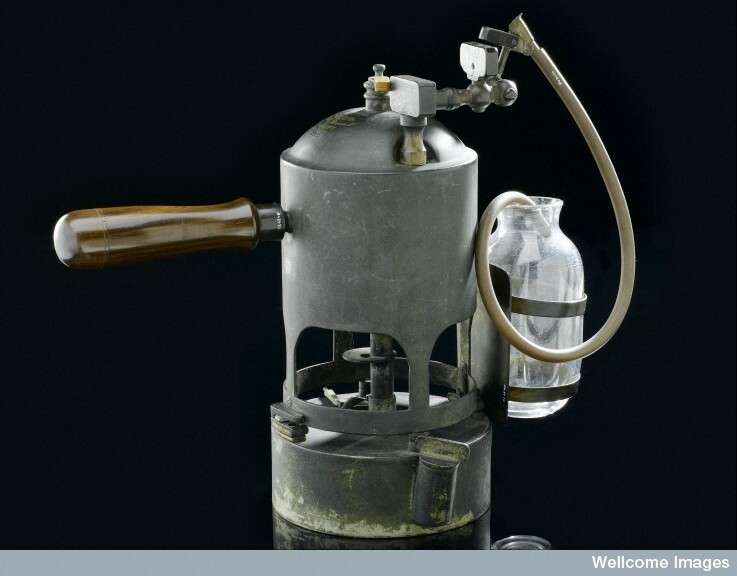 Carbolic steam spray used by Joseph Lister, England, 1866-1870. Courtesy of the Science Museum, London, Wellcome Images. In 1867, Lister published an article in which he proposed using carbolic acid (already used to treat sewage) to sterilize the operating room, surgical instruments, bandages, and wounds. Surgeons were encouraged to dip their hands—and yes, their beards!—into carbolic acid before operating. Working in the midst of a pungent yellow spray that smelled like tar was not ideal and inhaling too much carbolic acid could be dangerous. Lister continued experimenting throughout his career with new sterilization techniques. However he never embraced the idea of gowns, face masks, or gloves. The use of gloves in surgery was introduced by William Stewart Halsted (on whom Clive Owen’s character Dr. Thackery is based) in the 1890s. A pioneer of antiseptic surgery, one of his surgical nurses (whom he later married) had a bad reaction to the mercuric chloride used as a disinfectant, so he commissioned Goodyear rubber to make her some gloves. The early use of gloves in surgery was not about patient safety, but protecting the medical team. Like any new innovation, reactions were mixed. Some individuals embraced the idea of gloves, while others continued to operate bare-knuckled. We’re looking forward to the next episode. Let us know in the comments if you have any questions about what’s going on in the hospital and we will get back to you in a future post. This entry was posted in Collections, History of medicine and tagged antiseptic surgery, carbolic acid, gloves, Joseph Lister, surgery, surgical gloves, The Knick by nyamhistorymed. Bookmark the permalink.